Miriam Baker found her true calling as an artist in 1992 when she began sculpting. She is equally talented and experienced in painting, drawing and design work and successfully built entrepreneurial businesses in those fields, but she now focuses her talents on sculpture and specializes in life-sized portraiture. Through years of experience and training, she has become a go-to sculptor, sought out by individuals and organizations for commissions. Miriam’s sculpture of Elie Wiesel, world renowned author and Holocaust survivor, was requested by the Smithsonian Institution and is on display in the National Portrait Gallery Collection in Washington D.C. Among other celebrity commissions: television show creator Aaron Spelling, CBS News anchor Dan Rather and TV executive Les Moonves busts are on display at the Hall of Fame of the Academy of Television Arts and Sciences Chicago Academy of Fine Art. Her work also is on display in Boston at MIT, University of California, Irvine and University of Illinois. Chapman University, in Orange, Calif., is home to a collection of 20 busts and three reliefs, commissioned to Miriam, that honor donors who have made significant gifts to the university in the form of endowment chairs and professorships and building namings. Among historical figures and prominent individuals selected to reflect the gifts are George Washington, Abraham Lincoln, Ronald Regan, Alexander Hamilton, Mozart, economist Adam Smith, singer Ella Fitzgerald, film producer Cecille B. DeMille, and business leaders and philanthropists George Argyros and D. Arnold Beckman. She was commissioned by the city of Newport Beach, Calif., to sculpt a life-sized bronze figure of the late President Ronald Regan. Her sculpture was installed at Bonita Park, with many California politicians in attendance. View the (VIDEO – ADD LINK) of the installation reception. She also has done commissions for individuals in Minnesota, Idaho, Arizona, Washington D.C. and as far away as The Netherlands. Miriam’s artistic talent and eye are “God-given.” As a youth, she studied at the Chicago Academy of Fine Art and the Art Institute of Chicago, where she grew up. She moved to California as a teenager with her family, continuing her interest in art even as she went to nursing school and was a nurse for several years. After having a family of her own, she returned to the art field and continued her artistic studies, painting under the tutelage of esteemed masters Vincent Farrell and Frank Tauriello. She then taught painting classes for eight years, later expanding her professional ambitions and creative desires into new directions. She spent the next 25 years at the helm of her own interior design firm, specializing in model homes and high-end office design. Her formal training as a sculptor includes study at Goldenwest College with Darrell Ebert; master classes at the Scottsdale Artist School with Bruno Lucchesi, Richard Macdonald, and Blair Buswell; and numerous workshops with Paul Lucchesi in Pietrasanti, Italy and the Artist’s League in Virginia. She now works from her studio in her Balboa Island, Calif., home, where her portrait subjects, who come from all over the world, can gaze at the passing boats while she models their likeness and captures their personality for posterity. 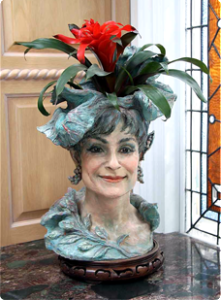 Miriam also sculpts life-size pieces with her longtime friend Rhonda Jones. Their joint piece titled “Mahogany” sits on the front porch and stops the steady flow of passersby in their tracks. Miriam’s passion for the beauty of art and design is limitless, and she has traveled the globe, collecting contemporary and classic art pieces that reflect the many cultures of the world. She and her husband, Art Baker, have between them five children and 12 grandchildren. She lives an active life of travel and family activities and continues to accept private commissions.